I am playing with styling the shelves in that old vintage cupboard in the kitchen. Pumpkins and pinecones and bowls of crisp apples are popping up here and there. 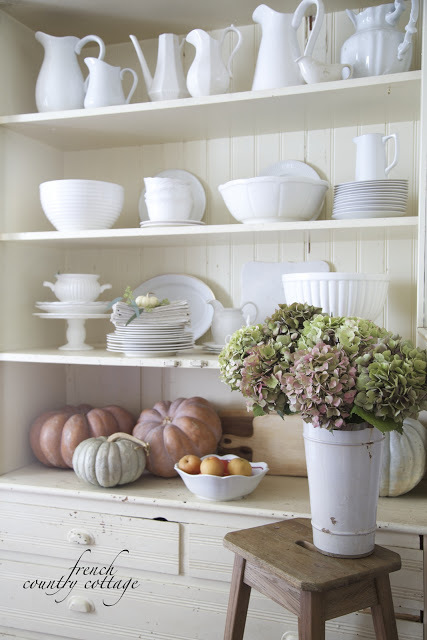 And even things like that vintage cupboard in the kitchen gets sprinkled with a bit of warm autumn charm. I am not a pro at styling shelves. But I am a pro at playing with styling shelves. 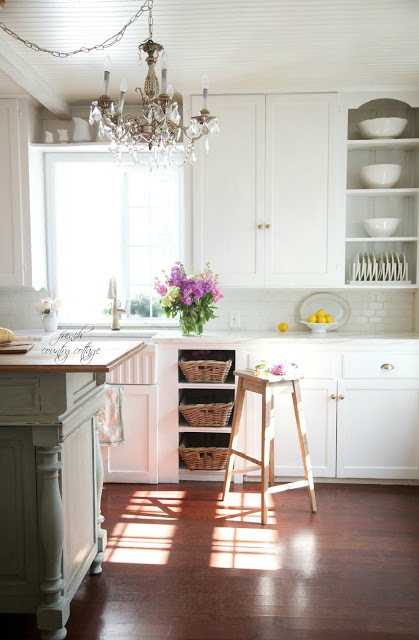 or armoire or even in the kitchen- more than just a few times. as the dishes are all moved out and shelves wiped down. and something short and chunky in the front. And then there are the bits of flowers or greenery... and finding the perfect spot for them to go. and that 15 minutes turned into an 1 hour. But honestly, styling shelves is one of those favorite things to play with in the house. 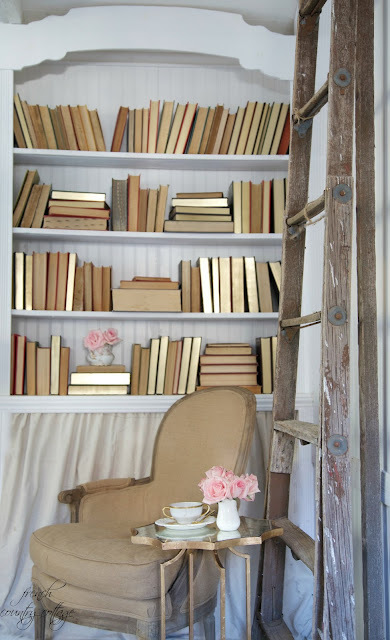 Shelves are interesting and charming little spots that seem to beckon for stacks of books, trinkets or dishes to be artfully arranged on them. and filling those shelves with them. and all simple colors and looks keeps it cohesive. talks to me any time of the year. Even the simplest of shelves holding every day items can look pretty while doing it. and perfectly, beautifully, artfully arranged? Do what you like-and what pleases your eye first. different heights, sizes and styles displayed together. 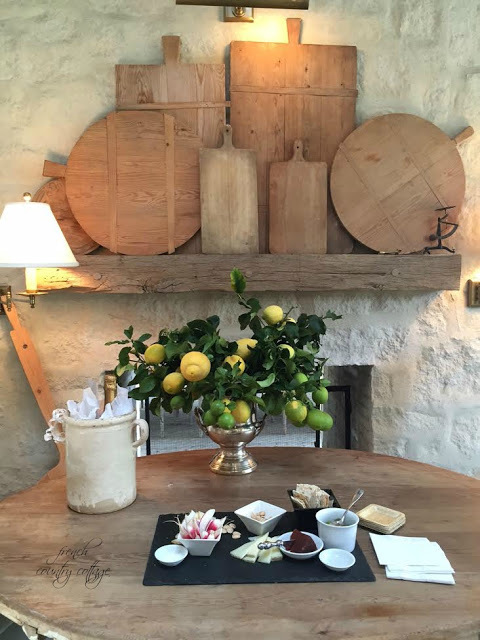 This bread board display by Brooke Giannetti at Patina Farm. it was super gorgeous and yet- so simple. Simple is key for me. Simple is color as well. All white dishes in a cupboard is always pretty. Stack them, line them up, etc. bowls or creamers is charming. a single item on a shelf can be effective at creating interest- and you can also stack 3 or four bowls to create even more charm. Keep it simple and interesting and style those shelves to create a display that you love. Whether it is books, dishes, dried flowers or anything else. and creating interesting open shelf displays. Love your style. Pictures are amazing. Everything you do is beautiful, Courtney! Great tips and pretty as always. Difto to everything you wrote. I love styling my home. 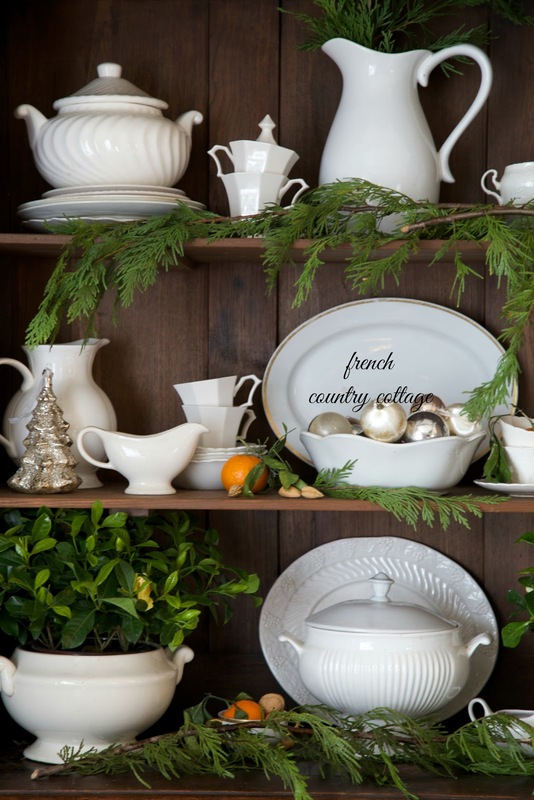 You know, it was really the playing with dishes in my china cabinet and on my buffet table that got me into blogging. 😉 I love taking everything down, washing what's dirty, wiping the shelves down then putting up a whole new look! Love it! Thank you for your beautiful style and inspiration!! Look at what you have done with this SWEET COTTAGE! 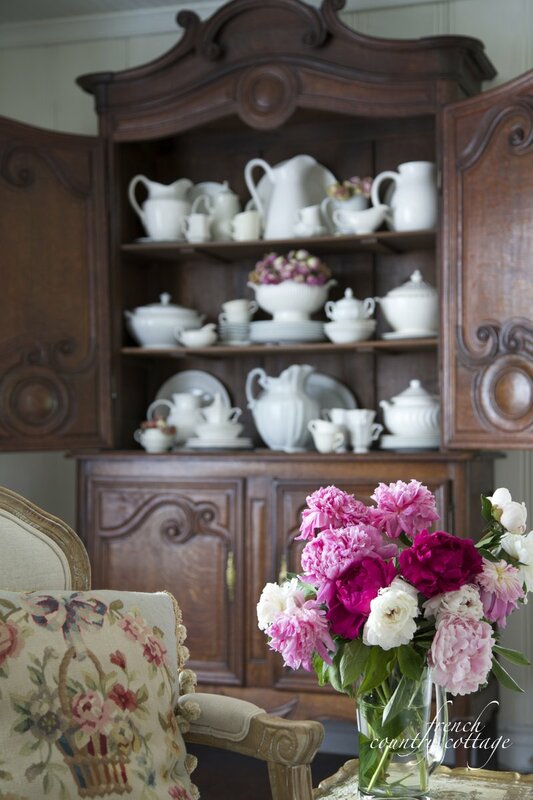 Handsome French furniture, adding CHARM, crisp clean linens, fresh paint, and fragrant flowers! How LOVELY is this and the fact you have shared your LOVE for decorating French with all of us. You are showing two things I am looking for. White pitchers, and the French side table in your office, for my living room. 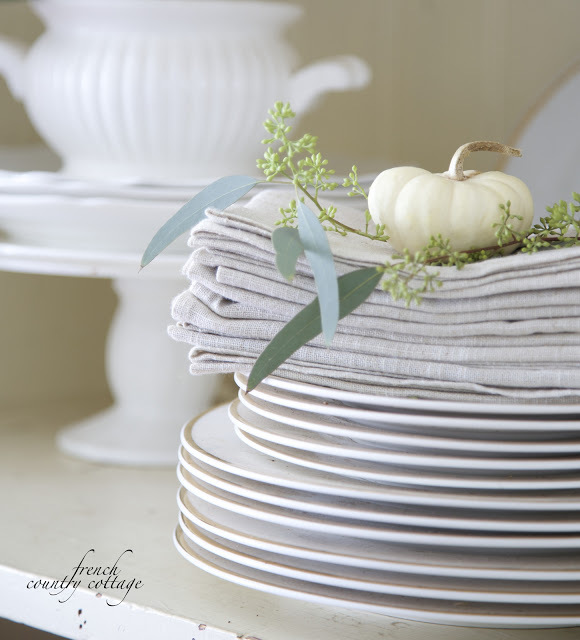 You have added the sweet soft charm that I love about French Cottage décor!! So much can be learned by seeing how other people style their shelves. We have shutter shelf on living room wall, sort of a replacement for fireplace mantel. Also have small area in corner of living room hubs put shelves in so there is enuf to keep me busy dusting shelves and treasures on them but have to be in right frame of mind to tackle restyling shelves. Usually tackle it when seasons are changing, for a holiday perhaps or just cause I get wild urge to redo all shelves in l/r. I do like to study how other people style their shelves, gives me ideas for using other items I may have can be used for a change, didn't think of before. Love how you style your shelves in photos shown. Many times will print out photo for rekindling ideas. Have notebook to keep photos for just such a purpose. This is special topic we all ponder, I would think, trying to think up new ideas of how to style shelves in our home. Have been doing that since I was a kid in parents home, haven't quit yet. My Mother worked 6 days a week then was busy cooking, doing laundry, baking on her day off, (some day off) so that left me chance to start trying out ideas before even had my own home.